Figs have arrived at the marketplace and they are a very welcome sight. Summer fruit season is now in full swing. To your stations! Figs have a double life. For this first round, I’m bathing figs in a dab of port, brown sugar and lemon peel and roasting them for about 20 minutes. This brings out their lusciousness and coats them with a delicious syrup. 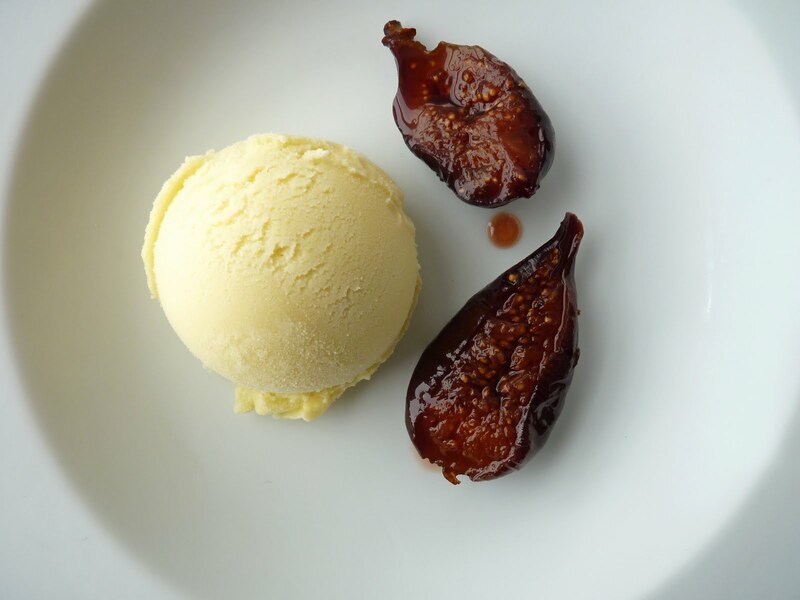 I then pair the figs with some luxurious Fennel Ice Cream, which gives the dish another very nice and simple creamy layer of nature. Fennel seeds are highly aromatic and often found in the cuisine of the Mediterranean, India and Pakistan. We see them here in products such as breads, sausages and Chinese Five Spice Powder. I think the flavor of fennel marries well with this fig preparation. I hope you're able to welcome figs now or sometime very soon wherever you are. They are so wonderful whether you eat them as they are or work them into your dessert or savory summer menus. Cheers! 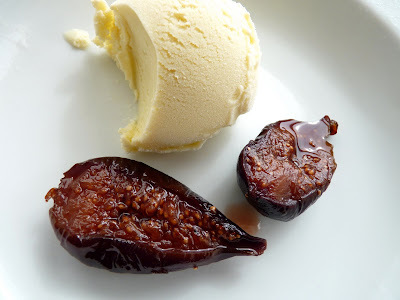 - The Roasted Figs are loosely based on a recipe from David Lebovitz that I adapted to suit the Fennel Ice Cream. His recipe also contains honey, sprigs of thyme and he uses red wine or liqueur as a base. It’s wonderful. It would be fun to try with balsamic vinegar as well. - Use a regular peeler to get the lemon strips without any of the white pith. 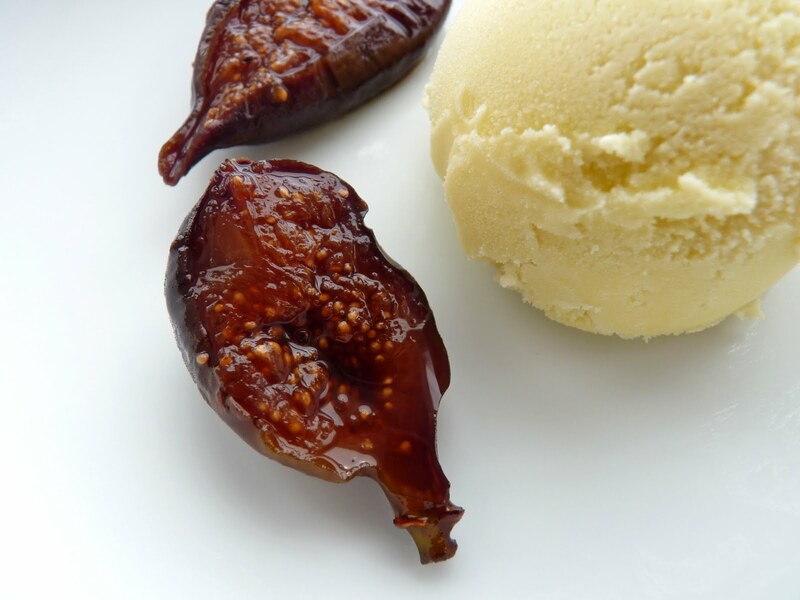 - These figs are also really delicious with Lemon Verbena Ice Cream. And probably Pine Nut Rosemary Ice Cream! Or if you’re a fan of chocolate, Chocolate Spice Praliné Ice Cream. 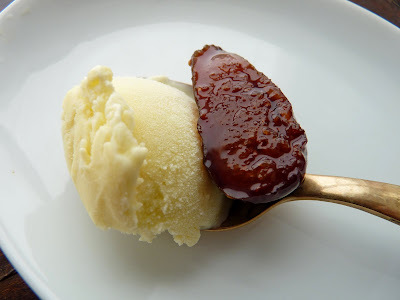 - A couple more of my favorite fig treats are A Provençal Sundae and Chocolate Spice Cake with Figs. For the ice cream, bring cream, milk, fennel seeds, sugar and a pinch of salt to a low simmer. Take off the heat, cover and let steep about 30 minutes. Strain out the fennel seeds and reheat the cream mixture just until warm. Whisk yolks together in a bowl. Add milk mixture in a slow stream, whisking constantly. Return the mixture to the saucepan and cook on medium low, stirring constantly, until mixture coats back of spoon and a track remains when you run your finger through it. Do not let the mixture boil. Immediately strain the custard into a clean container and let cool completely. Cover and place in your refrigerator to chill thoroughly for a few hours or overnight. Freeze in your ice cream machine according to directions. Pour into a clean container, press a piece of plastic wrap into the surface, cover and place in your freezer to firm up. To roast the figs, preheat the oven to 400 degrees. Cut the figs in half and place them in a bowl. Add the port, brown sugar and lemon peel and toss to mix and coat the fruit. Place the figs cut side down in a single layer in a shallow baking dish. Cover the dish tightly with foil and bake for 15 – 20 minutes. Remove from oven and gently lift the foil away from you to avoid a steam burn. Cool the figs and serve. Gosh. This sounds delicious. I'd never thought of pairing figs and fennel but I can definitely see it working - I've made quite a lot of herb/spice ice cream but have never thought of fennel before. If you can get your hands on some blackcurrants I'd really recommend the flavour combination. I'm a licorice person so this sounds divine to me. The licorice ice cream I make is from a Fran Gage recipe using licorice tea (I used Yogi), but the gelato at GROM is made with Italian licorice powder. It's delicious. this looks like happiness. it's so sophisticated too! I'm going to have to try roasting some figs--they look delicious! i always look forward to your pairings. this one, top notch for summer. You peeps are the very sweetest! Thanks for stopping by. Elly, that looks delicious. I don't think I've ever seen fresh black currants here but I could get them if I travel across the Bay. Victoria, I've never heard of the licorice and chocolate combo! I'll have to try it. How lucky you are to have GROM. Sinful Sundays, these figs are worthy of a sinful Sunday for sure! Thanks so very much for your constant support, vanillasugar! Hmm. I think sometimes--like your figs--I live a double life, often bathed in port. ;) This recipe sounds lovely. I'm a sucker for fennel. And figs. Wish I had some fresh figs to roast. They are so hard to come by. Your ice creams are always a delight. I love to make ice creams and panna cottas with herbs and spices. What I like most about your combos is we can take either item and use it another way. I can see this ice cream with other roasted fruits or over fruit pies and I can see the figs with just some creme fraiche or sour cream. When I found your blog, I clasped my hands together, looked toward the sky and thanked the clouds. I can't wait to start experimenting with some of your recipes. Plum, you have me chuckling! Barbara, yes, you've got the hang of it! Welcome and thank you, Francis-Olive. Hi there, me and my best friend already make this one and the result is awesome! It's tasteful and indeed delicious. With a combination of cold ice cream and a roasted figs, so yummy! Such a smart flavor combination! I had never even considered fennel ice cream before. Genius!